Now that it's October, I've picked out my winter coat and cosy scarf ready for Autumn. This also means that it's time to break out the dark glossy nail polish shades and put the bright ones to the back of the drawer. To celebrate the new season, I picked up a brand new polish in the form of Rimmel Black Cherries. 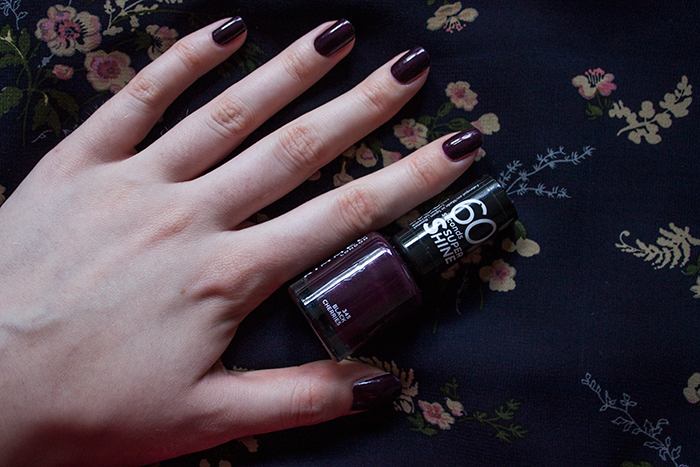 Black Cherries is part of Rimmel's 60 Seconds Super Shine range which is pretty self explanatory. It's a gorgeous deep purple with a glossy finish. So glossy infact that a top coat isn't really needed at all. The polish formula itself applied really well and easy to blend out. The brush is a little thick for my liking but it was still pretty easy to use. Sadly although it is a gorgeous shade, I found that it didn't last quite as long as I'd hoped. I'm guessing this is due to the quick drying aspect of the polish. I got around 2 full days but after day 3, chipping was everywhere. Possibly not the best quality nail polish out there, but there's no denying it looks gorgeous on the nails.